4 - 5,5,5........Lump von Hagenstolz. Körklasse 1A (2 years of age). Alva vom Franckenhorst passed the Erstkörung at 2 years of age with highest rating for hardness and working drives however he did not pass his second Körung test due to his HD score and therefore was not awarded breeding status 'for life' (Angekört auf Lebenszeit). Alva was considered a very strong natured dog and Mr Willie Bork, D.V./D.V.G. working judge and professional trainer, was always in praise of Alva's working ability. Alva's full brother from a repeat breeding, Ero vom Franckenhorst, was the winner of the DVIN Working Championship in 1979 and placed 4th at the D.V. Meisterschaft in the same year. Ero also passed the Erstkörung at 2 years of age with highest rating for hardness and working drives. “Alva was a very impressive red male with a typically strong head. He had a long dry well muscled neck, very good markings and excellent dark eyes. His coat was rather thin but he was almost perfectly built. His fiery temperament took quite a lot of handling. He had a very strong and dominant character. 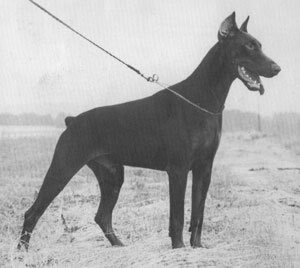 He was the first Dutch bred Dobermann to pass the German Körung. He also easily passed his Schutzhund I. His trainer Mr. W. Bork from Germany wanted to train him for Schutzhund II and III but the owner was afraid that afterwards Alva would become too difficult for him to manage so he took the dog back to Holland. Cristel: SchH 3, DVIN-Leistungssieger and passed the ZTP with 1A rating for character and V for conformation plus winner of numerous show championships. She is dam of the van de Eland “D, E, F, G, H” litters (Davina, Egor, Holly, Hertogin Nina). Iwo: sire of the Schutzhund “B, H, K” litters (Hero, Hedy, Kira).